I am the kind of girl that if I have even the slightest chip on my nail polish I will immediately take my nail polish off of all my nails and re-do them. I had been hearing great things about gel polish about how long they lasted without chipping and that they had a great color selection. 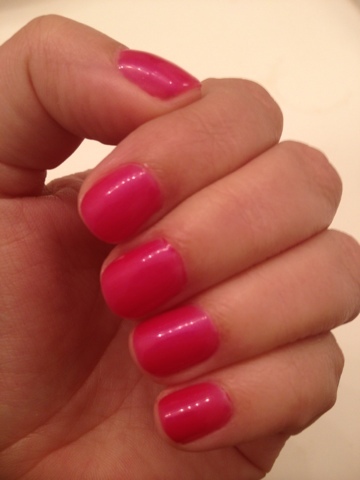 So today as I was running errands I noticed that my nails were chipped so I decided to give the gel polish a try. I went to a salon where I had heard great reviews for a gel polish manicure and they were so friendly and I didn't have to wait in line although they were pretty busy. The process was just as long as a normal manicure (1 hour) the difference is that between each coat they put your hand under an LED light to cure the polish, they did mine for 45 seconds. So first they prep the nails then by numerical order 1. Base coat 2.LED light 3. Color polish 4. LED light 5. Second coat of Color polish 6. LED light 7. Top coat 8. LED light. 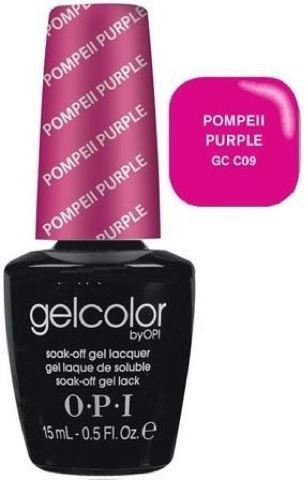 I decided on the color Pompeii Purple which is not very purple it's more like pink with light glitter of purple and blue and I could not be happier. I will do an update to see how long they truly last without chipping.